Oddly enough, only weeks after my post about how my younger brother was scammed out of $3,000 on Craigslist, I received two responses from scam artists after posting a few items for sale on Craiglist. I've listed things to look for (below) along with the email message they sent me. Thanks for the prompt response and i will like you to withdraw the advert from Craigslist,i don't mind adding an extra $20dolls for you to take the advert down from craigslist so that i can be rest assured that am in hand of the item.I don't have time to come take a look. I will be paying via cashier's check,and it will be over night payment .You don't need to bother your self with the shipment Ok,i will take care of that.So i will need you to provide me with the following information to facilitate the mailing of the check. me more pictures. It will take about 7days for payment to get to you. and consider it sold to me, Include your phone number. I have already reported these incidents to Craiglist, but unfortunately there is no barrier to entry for these con artists to create email accounts, which means they can and will create an infinite number of email accounts. 1) Of course the deceiver won't be able to meet you in person (they'll make up some excuse), so they'll suggest sending you a cashier's check or money order. They guarantee that they won't pickup the item until you have received the check. 2) The swindler will pretend to be interested and either ask you to send more images or inquire about the condition of the item. 3) Usually, they scam artist will offer additional $$ for you to keep it for them, which is BS because they aren't interested in the item at all. They just want to make you think they really want it. 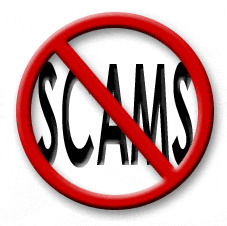 4) The scammer will ask you to remove the advertisement from Craigslist. Doing this will delete the posting from Craigslist, which makes it difficult to for the online community to track nthe incident futher. 5) Last, but not least, the con artist will request for your full name, mailing address and phone number to send you the payment. BEWARE: If you receive a response with these indicators, you have become a target! You should either report it or block them from contacting you. The idea is that they will send you the money order or cashier's check in an amount larger than promised. They'll claim they made a mistake and ask that you cash the money order at your bank and return the outstanding amount via wire service. The scammer will insist that you keep an extra $100 for the inconvenience. You will find out a day later that the money order was not valid and your bank pulled the funds from your account. By this time, you would have already wired the money to them and voilà! --- You've just become the umpteenth victim!!! Thanks for posting. Just got e-mails from both these accounts for my items. I am removing everything from craigslist. It is too bad that people have to be so shameless. I also suggest reporting any such e-mails to the FTC also. We got checks from John Deng and after much back and forth with him asking us to cash the checks and send the extra money overseas we decided to send them back He actually called our house at 5:30 in the morning to find out why we have not cashed the checks. We did send some of the info to the FTC. Since he already has our address I guess it doesn't matter if we mail them back. Thanks for the post, I just got a similar email from a scammer. I did send my husbands name & work address, once he said I would pay his driver I looked online for craigslist scammers & found all kinds, thank god for these posts or we would have cashed the check! I'm so glad that you found this post useful. Stay safe! I got a message from the Chris Merkus.......Trying to scam me with an email very similar to the one posted on this website.....THANKS for making us aware. I got almost an identical email from Chris Merkus. Almost word for word. OMG! Is there anything I can do to help get this guy caught?? ?